Like most of the rest of the country, we have had an unseasonably warm spring and early summer here. One of the consequences of this has been that many of the local fruits and vegetables are coming on much earlier than normal. So I was only a little surprised to find fresh local blueberries at the farmer’s market a few weeks ago. Blueberries don’t usually hit until about mid-July in our area, but here is was the second week of June and they were at the market already. I try to avoid buying trucked in fruit whenever possible, so I was holding out until I could get local blueberries to make this recipe from the Cakes section of the Modern Baker Challenge. I just never imagined it would happen this soon. This recipe is a combination of a blueberry crumble and a cake. 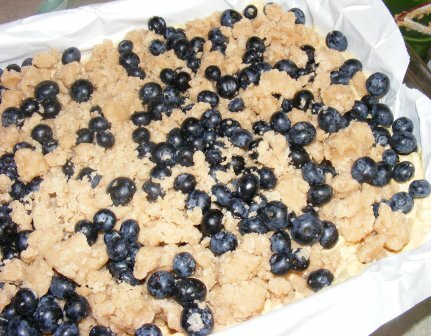 It has a thick cake layer on the bottom, topped with a mix of blueberries and crumb topping. 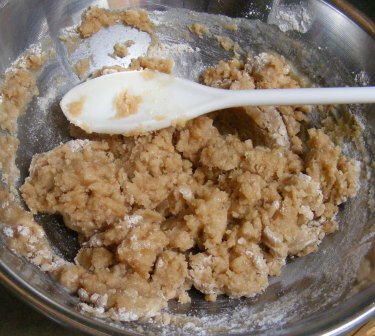 I began by making the crumb topping, which consisted of flour, baking powder, sugar, cinnamon, nutmeg, and butter. 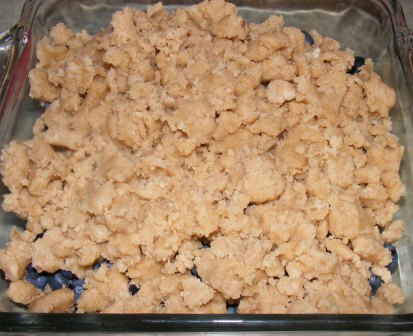 Because the butter was melted, it had more of a doughy consistency than a crumb topping made with room temperature butter. I crumbled the topping onto the blueberries in a baking dish and set them aside while I made the cake. 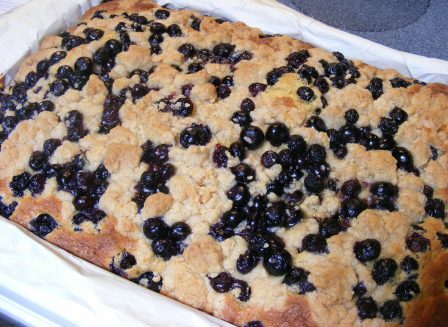 I found this step kind of odd, as I expected the recipe to say to put the blueberries on the batter, then add the crumb topping. 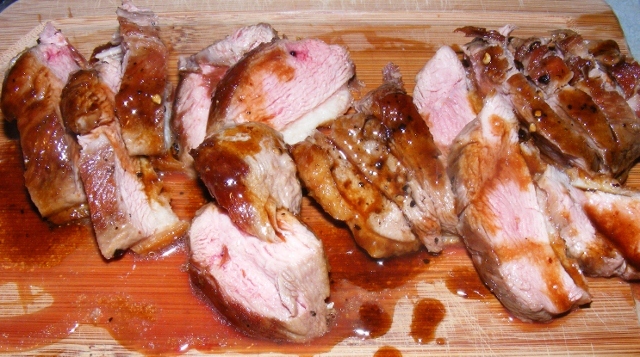 It turns out my instincts were right on in this case, as I got an e-mail from Nick Malgieri after I made this recipe noting that this instruction was an error in the book. Either way, it worked out fine. 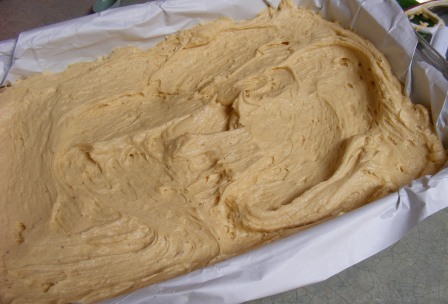 The cake batter was made with flour, butter, sugar, eggs, vanilla, baking powder, and buttermilk. 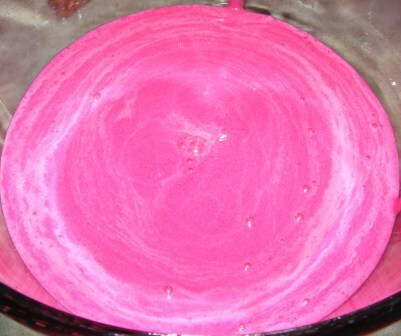 After mixing it up, I spread it in the pan. I topped the batter with the blueberries and crumb mixture. I baked the cake for about 40 minutes, until the batter was set and the crumb well-colored. 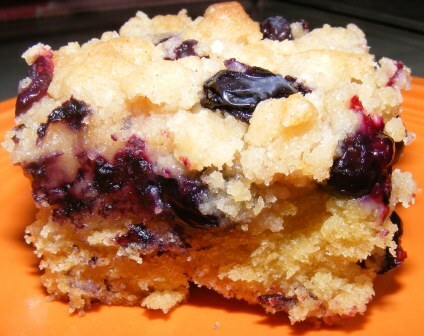 The blueberries melted into a jam-like consistency and were delicious with the crumb topping. I thought the cake layer was a bit too thick for the amount of topping. I think if you doubled the amount of blueberries, it would be perfect. 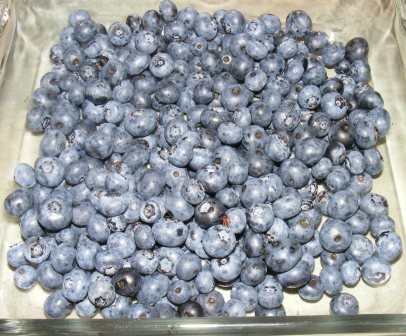 Abby liked this recipe a lot (she has a thing for blueberries), and she wrote the official post for the Challenge. You can check it out here. 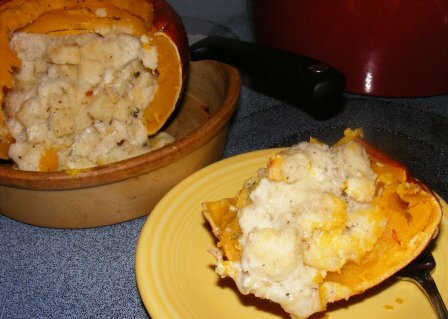 My love of all things pumpkin is well known, so I don’t think anyone was surprised when I suggested a pumpkin dinner roundup, where everyone would make a different pumpkin recipe and post them all on the same day. 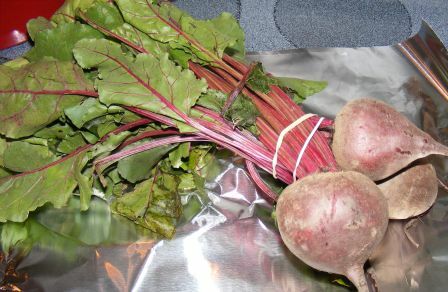 My contribution was this side dish, which I adapted from Dorie Greenspan’s recipe. I made it the other night for dinner. Don’t think big jack-o’-lantern pumpkin when you go to make this dish. 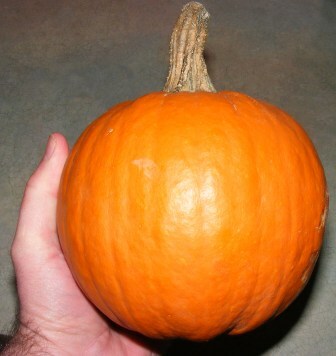 A 2 1/2 pound pumpkin is pretty small and can be found with the “baking pumpkins” at the grocery store. Preparing it for baking, however, is a lot like carving a pumpkin. Once the goop is removed, it’s just a matter of filling it with stuffing and pouring on some spiced cream. Then you put the lid back on and slide it into the oven for a bit. 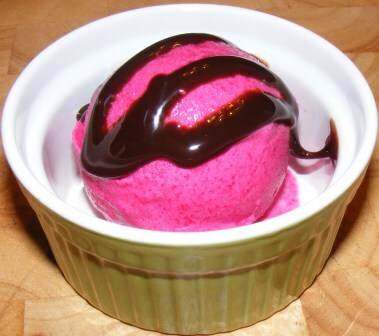 The skin will darken and toughen up while the insides get bubbly and delicious. 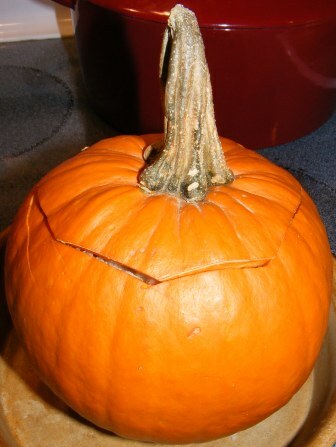 Cut the top off the pumpkin jack-o’-lantern style and remove pulp and seeds. Discard seeds or save for roasting. Season the inside of the pumpkin generously with salt and pepper. 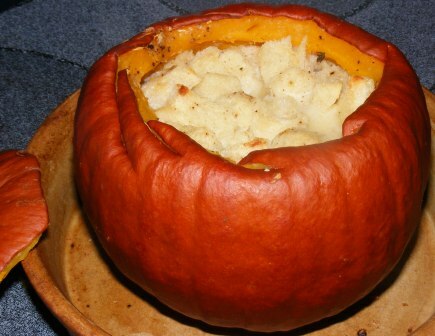 Place the pumpkin in a round baking dish, preferably one that’s just slightly larger than the pumpkin. In a medium bowl, combine bread, cheeses, garlic, and thyme. 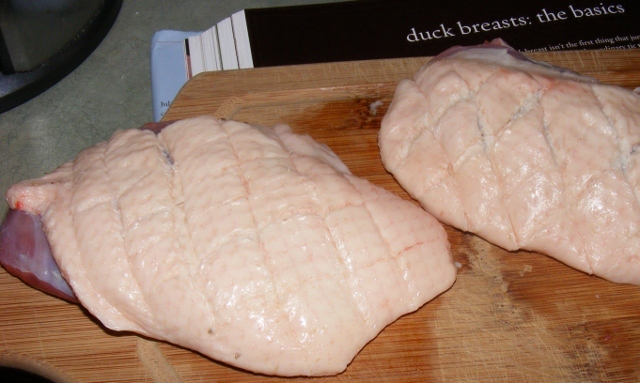 Season with a little salt and lots of pepper and toss well. Spoon filling into pumpkin and pack lightly. The pumpkin should be filled to the top but not overflowing. Stir together cream and nutmeg, then pour over filling in pumpkin. Put the pumpkin top on the pumpkin. Bake for 1 hour. 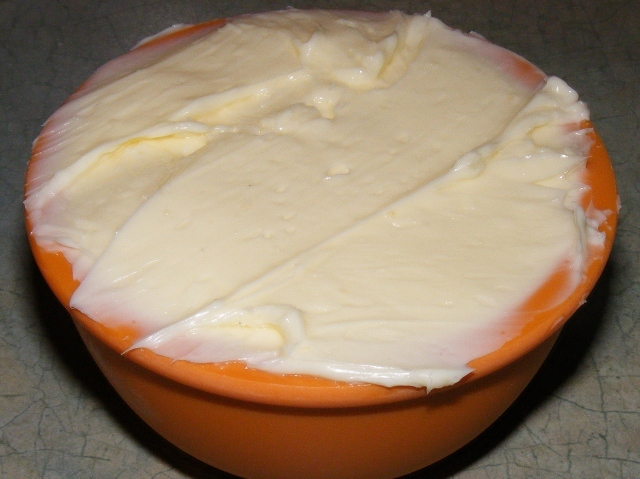 Remove lid and continue baking for about 30 minutes, until the filling is bubbly and the top nicely toasted. 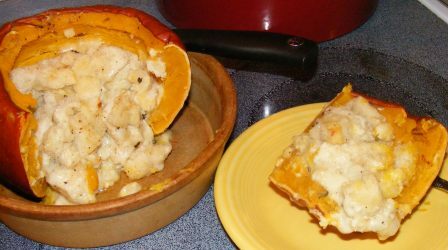 To serve, carefully (it will be very hot) reach inside the pumpkin with a large spoon and scrape the cooked pumpkin meat free from the sides. 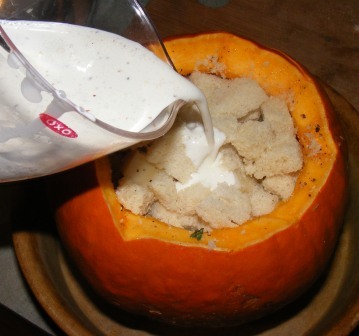 Mix the pumpkin with the stuffing and replace the lid. 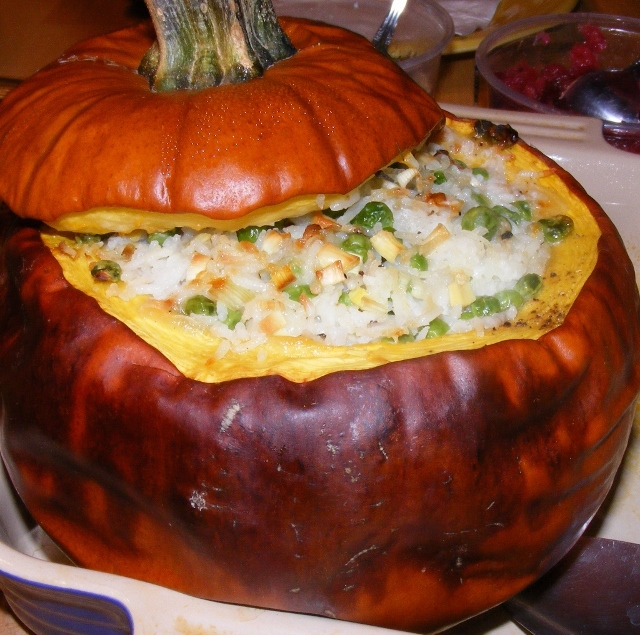 Carry the pumpkin in the baking dish to the table. 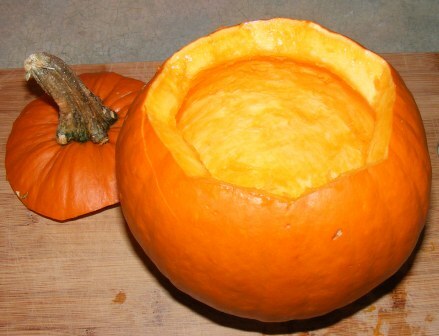 When ready to serve, remove the lid and spoon directly from the pumpkin. You’ll note that I sliced the pumpkin rather than mixing in the flesh like in the recipe. I didn’t care for it sliced as well. 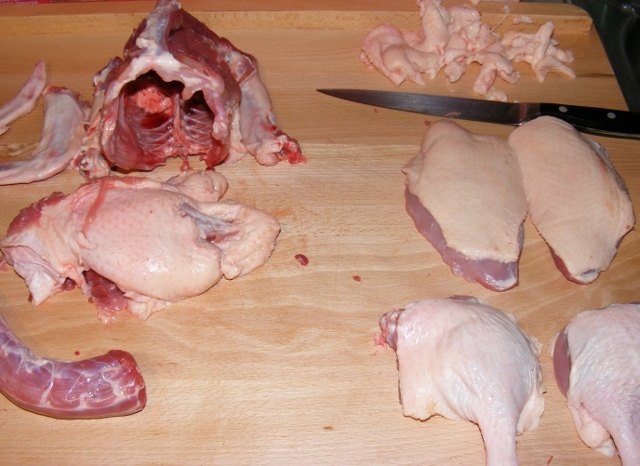 The skin was very dry and leathery, and it was difficult to cut, even with a good, sharp knife. And we were left to deal with it on the plate while eating. I made a note to mix it together inside the pumpkin next time. This was such a delicious dish. I couldn’t wait to make it again. So, a few weeks later I decided to bake another pumpkin. My parents were in town, and I thought I would switch things up by replacing the bread cubes with rice and adding frozen peas. 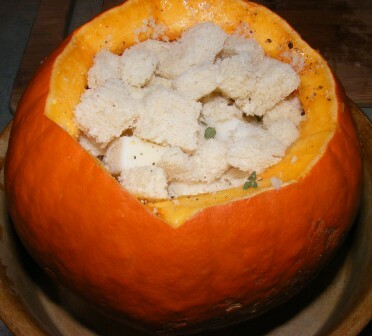 We put the whole pumpkin on the table and served it by scooping out the filling, along with some of the pumpkin flesh. It was so good, we all agreed that we would add it to our Thanksgiving menu this year. 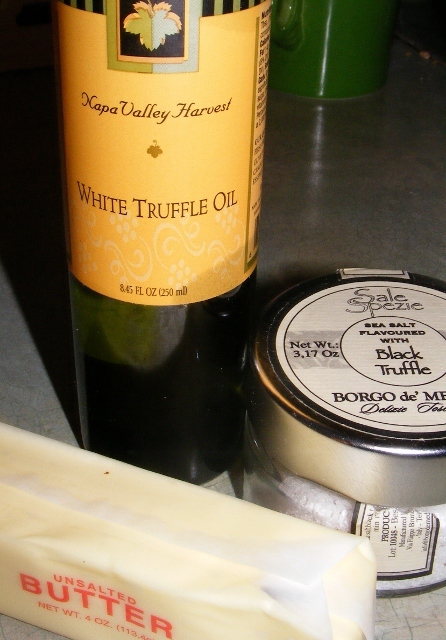 In addition to the pumpkin dinner roundup, this post is also part of French Fridays with Dorie. French Fridays with Dorie is kicking off August with a delicious, simple recipe that is sure to become staple in many a kitchen. I picked up some grape tomatoes at the farmer’s market over the weekend, and they were perfect for this recipe. 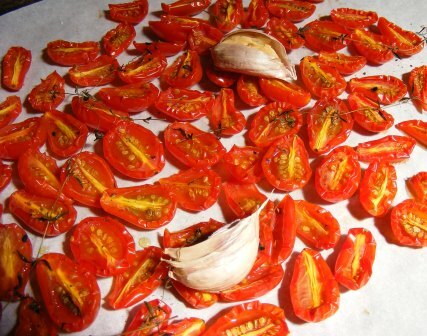 To roast the tomatoes, I cut them in half and put them on a baking sheet covered with parchment paper. I sprinkled the tomatoes with a pinch of salt and a couple cranks of ground black pepper, drizzled them with olive oil, and nestled a few cloves of garlic and some fresh thyme around them. I roasted the tomatoes at 225°F for three hours (yes, three hours! 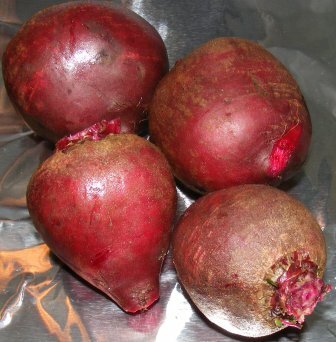 ), until they were shriveled and looked a little dry. Although they looked dry, the tomatoes were still juicy, and roasting intensified the tomato flavor. 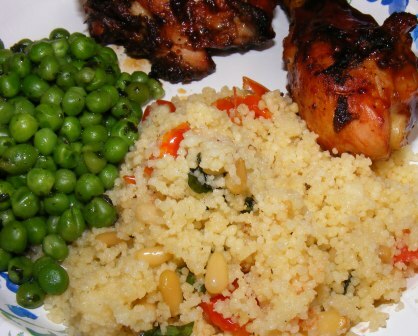 And the garlic, herb, oil, and spices added subtle notes to the flavor. I ate a few of the tomatoes, then packed the rest in olive oil to use later. But not much later. 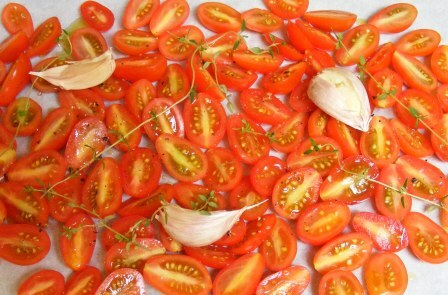 Dorie says that the tomatoes will remain usable in the oil for several weeks. I suspect they would keep for longer than that. Mine, however, never got the chance, as I kept finding uses for them. And before I knew it, they were gone. 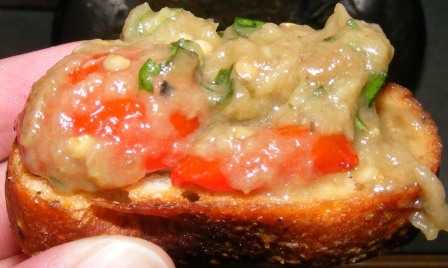 So the next time you’re at the market and see a pint of cherry or grape tomatoes, grab them and give this recipe a try. 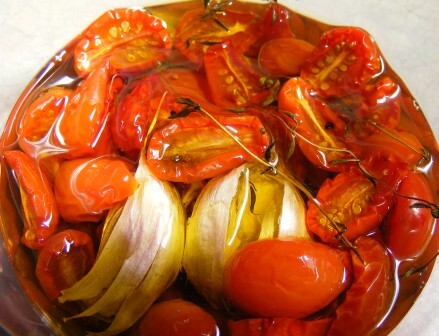 By slow roasting tomatoes, the flavor and color are intensified. 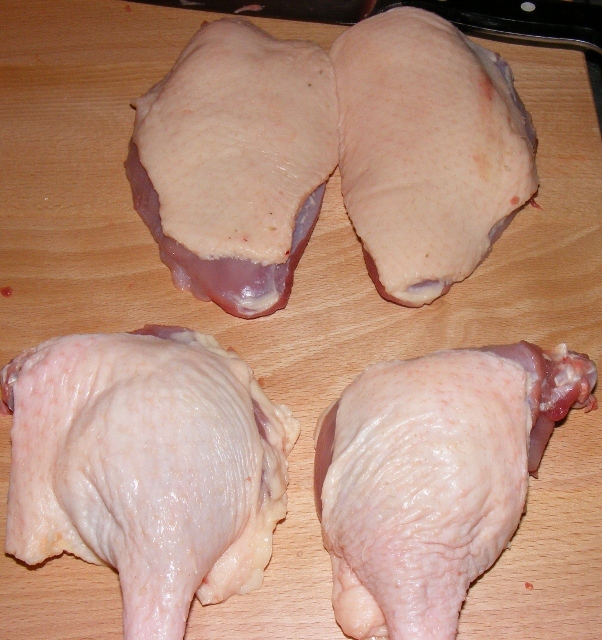 And if you pack them in oil with garlic and herbs, you’ll find yourself adding them to all kinds of things. Whatever you end up doing with them, they’re sure to go fast. Especially if you keep eating them out of the jar. Not that I know anyone who does that…. There are a lot of “Farmer’s Markets” around these days. I put the words in quotes because not all “Farmer’s Markets” are really Farmer’s Markets. To my mind, a true Farmer’s Market only allows local farmers and food artisans (cheesemakers, bakers, etc.) to sell food grown or produced locally. So if you live in the Midwest and go to the market in early Spring to find acorn squash, corn, and tomatoes, you know you’ve stumbled on a “Farmer’s Market”. Get back in the car (or better yet on your bike) and move on. 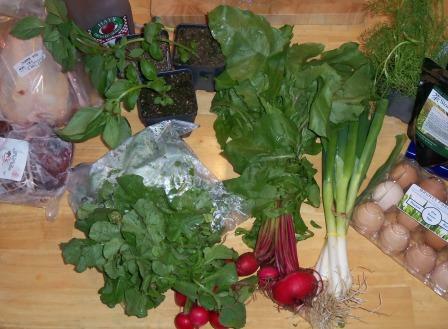 Sure, it’s not the same bounty I would come home with in mid-Summer, but that’s the beauty of the Farmer’s Market. What’s fresh is what you get. Now don’t get me wrong. Despite my own ideals, I’m far from a locavore. I do most of my shopping at the local supersized supermarket, and I buy what I want when I want it. But I am becoming more aware of the impact of my decisions, both on the environment (do I really need strawberries in February?) and, more to the point, on my and my family’s health. So what am I going to do about it? Well, for starters I’m going to do more of my shopping at places like the Countryside Conservancy Farmer’s Market, where I can shake the hand and look into the eyes of the men and women who grow my food. I talked to several of them today, and they all invited us to visit their farms to see how they operate and where our food comes from. I’m going to take the kids on several farm outings this year. Having grown up in Eastern Lancaster County, Pennsylvania, I know what a farm looks, sounds, and smells like and how sustainable farmers (the Amish were green before green was in vogue) grow food. But to my kids, a chicken is something you buy in a package at the store, cleaned, cut up, and not in any way resembling a living creature. I feel like I owe it to them to teach them how this whole food chain, circle of life thing really works — blood, guts, and all. And I guess it’s time I finally read The Omnivore’s Dilemma. As I understand it, this book is not an in-your-face, Upton Sinclair, scare the crap out of you so you never want to eat a burger again food industry expose. Rather, it’s a well-written, no-nonsense, approachable discussion about how we interact with what we eat and how our food sourcing decisions impact our health and the health of our planet. And finally, when I do go to the mega-supermart, I’ll pay more attention to what I am buying, where it comes from, and how it was produced. I don’t promise to give up bananas, but I will plan my menu around what’s in season. And I’ll do my best to cut unnecessary chemicals out of my family’s diet.